This is a Cuban classic. I bought a Cuban cook book last week and although it’s more like a bloody history book than a cook book, there are some good recipes in it. This one in particular is delicious. Orgiginally a vegetarian soup, in the extensive evaluation of the meal, the book pointed out that often Chorizo sauage is often added. Who am I to argue. Remove the kernels from the sweetcorn heads, in a food processor or with a handblender, blend the kernels with the stock. Remove to a pan. In another bowl, blend the capsicum, garlic, oil, tomato puree and squash. 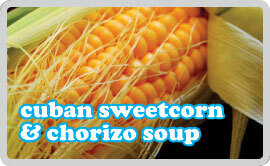 Heat the stock/sweetcorn mix gently, then add the other blended ingredients and simmer for about 7 minutes. Stir in the cream and remove from heat. Pass the soup through a seive to get rid of any lumps. Return to the pan and add some salt & pepper and simmer again for a couple of minutes. Take about 1/4 out and add to the beaten eggs stirring well. Return this to the pan and simmer for about 2 minutes. In a separate pan, slice the chorizo thinly and fry in a little oil for about 3-4 minutes each side until a little crispy. Add these to the soup and stir in.